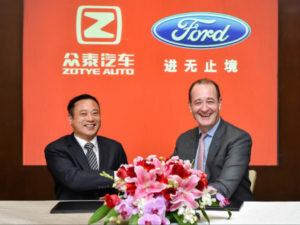 Ford and privately owned Chinese automobile manufacturer Zotye have inked a deal to develop and manufacture electric vehicles under a new Chinese brand as they also explore the market for mobility services. The €643.2m (£569.7m) joint venture will develop vehicles purely aimed at Chinese demands and will have a dedicated product research and development centre as well as its own sales and services network and a new manufacturing plant in Zhejiang Province. Earlier this year, Ford announced that at least 70% of Ford-branded vehicles sold in China will offer electrified powertrain options by 2025.